There are places that just feel like home thanks to the people you meet there. For Jessica and Arin, the Irmo campus of Seacoast Church was one of those places. The two had moved to the Columbia area two years apart and found themselves attending services at Seacoast; they even sat in the same area of the sanctuary for months without meeting! Remembers bride Jessica, "[My friend] Madison and I always sat in the same area of the sanctuary. Arin always sat in the same area of the sanctuary. Somehow, we never noticed each other, until one random Sunday in October or November 2014, when Arin sat in the pew directly in front of me. After the worship songs and the introduction from the pastor, everyone was asked to greet those around them...and that's how it all began." The two became friends even though both secretly wanted more, and, after a year, Arin got the courage to ask Jessica out on an official date, and she said yes. By November 2016, the two knew that they had something special. 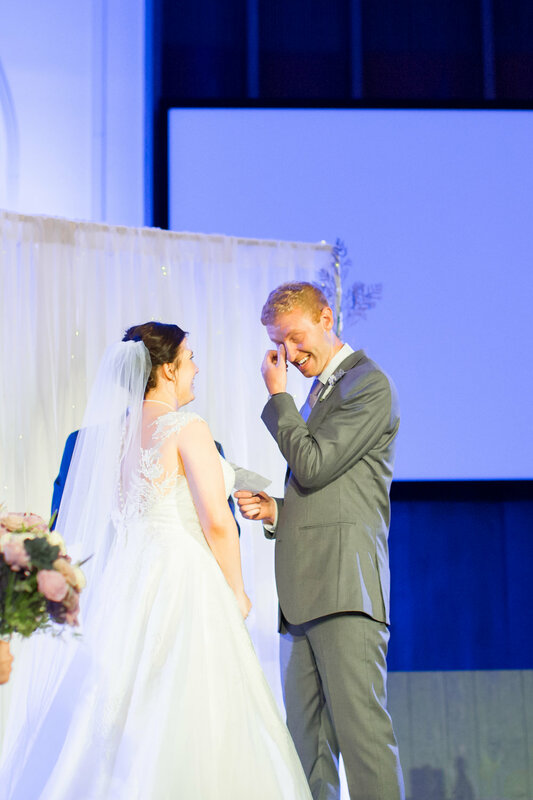 During their 2 year anniversary celebration, Arin told Jessica that they had to swing by their church to help out the pastor; instead of setting up tables as she anticipated, Jessica found herself walking through the candlelit sanctuary space, where Arin popped the question. After meeting at the church, and getting engaged at the church, there wasn't any question about where they had to get married! 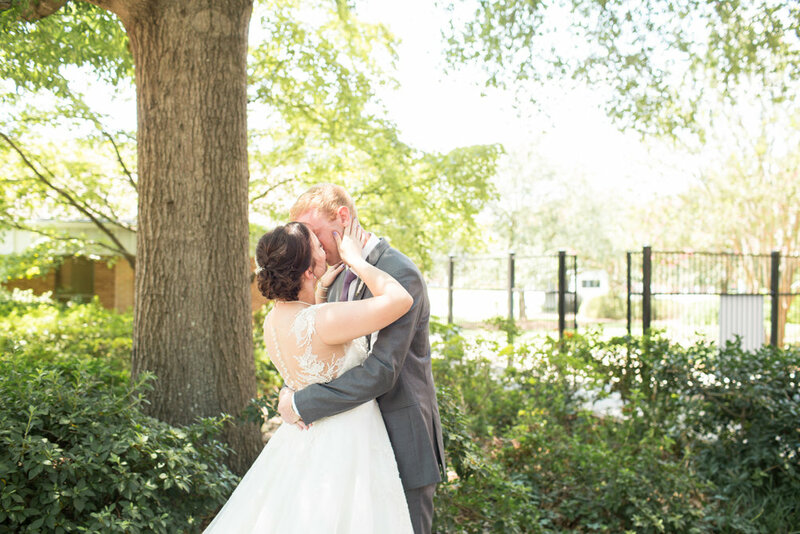 This sweet church ceremony at Seacoast Church was followed by a reception at Doko Manor in Blythewood, and was beautifully captured by Columbia wedding photographer Jessica Hunt. If you want to save money on your wedding budget--or if you just enjoy being crafty!--going the DIY route is a great choice. Jessica and Arin wanted to add personal touches throughout their wedding day, so they included a wide variety of projects in their wedding planning. 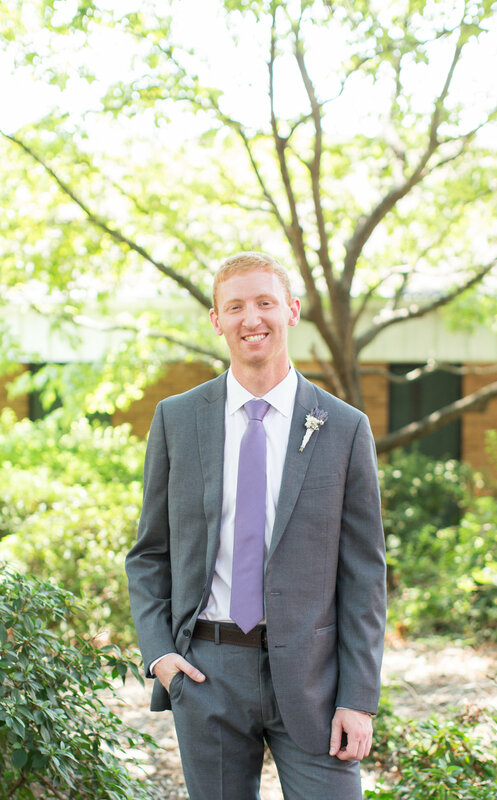 Says bride Jessica, "I did not want to go with all of the trends right now (burlap and lace, for example), but loved the simplistic and home-y look of those styles. So I browsed Pinterest a lot and brought in my own style." The end result was a beautiful range of purples and greys highlighted in vintage books, the handmade ceremony backdrop, scattered jars and lanterns, and the programs. The completion of all of these fantastic DIY projects is even more impressive when you consider that Jessica taught full time, finished grad school, and planned the wedding in the year leading up to her big day! The literary inspired centerpieces were a favorite project of the bride's. She states, "I love the look, feel, and smell of old books (I am a huge book/word nerd), so I wanted to have that on the table for centerpieces. They were all old books I collected from my personal collection, my great-grandma and great-aunt's collections, and from used books stores." While they didn't make their own wedding food, their attention to detail was evident in their catering choices, too. In an effort to infuse the day with their favorite things, they included Arin's favorite snack of cookies and milk and Jessica's favorite snack of popcorn in their offerings to their guests. As their main meal, they served up tacos, the one meal the couple can't ever resist! The two both went into shopping for their wedding attire with an idea already in place. Bride Jessica was leaning towards an A-line dress, while groom Arin wanted a grey suit. While trying on dresses, Jessica started to narrow down her choices and selected something unexpected. "I'm actually very modest, so I was not immediately drawn to the dress I bought and was hesitant to try it on, but the illusion top and back and gorgeous lace detail on the bottom made me want to try it on. Once I tried it on, I loved it and that was that! In some ways, it was exactly what I had pictured myself buying, and in some ways it was completely different than what I thought I wanted!" As for Arin, he stayed true to his initial vision and began to research the perfect wedding day suit. He discovered that The Black Tie would send a suit to his home so he could try it on before making a decision. While it was a bit different than going into a traditional suit store, Arin loved the experience and immediately ordered his grey suit from them. Another fun twist on the traditional decor that Jessica and Arin included were their eco-friendly floral elements. "While I appreciate fresh flowers, I love the idea of flowers that can last forever and look the same forever. I saw wooden flowers made from sola wood on television and went from there. 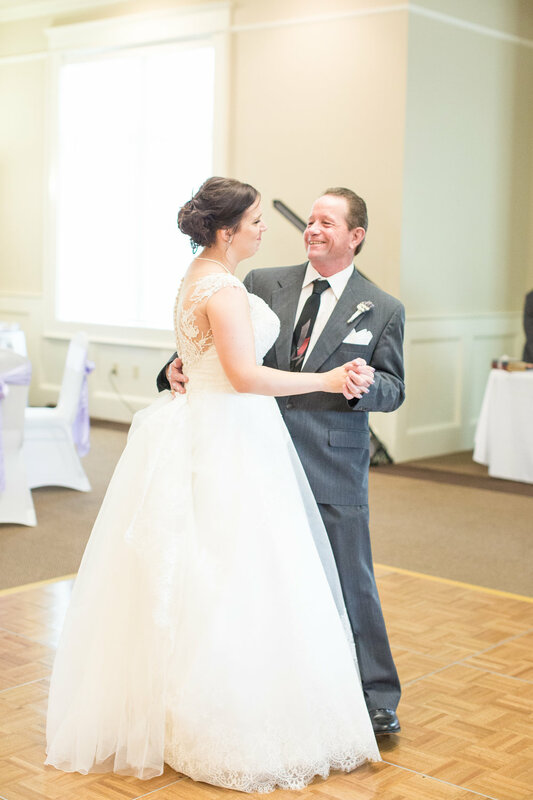 I had an issue with a company who was supposed to make the bouquets for me, so I ended up ordering just the flowers myself and put them together into bouquets and centerpieces with my twin sister/made of honor," remembers bride Jessica. 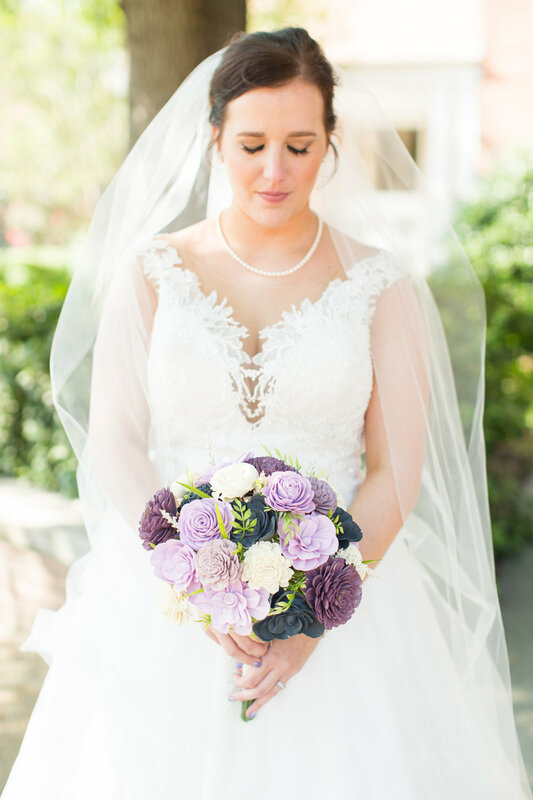 "I used dried lavender, partially because it matched the color scheme, but mostly because I love the smell of it and the calming effects of it (which every bride needs the week and day of her wedding!!). 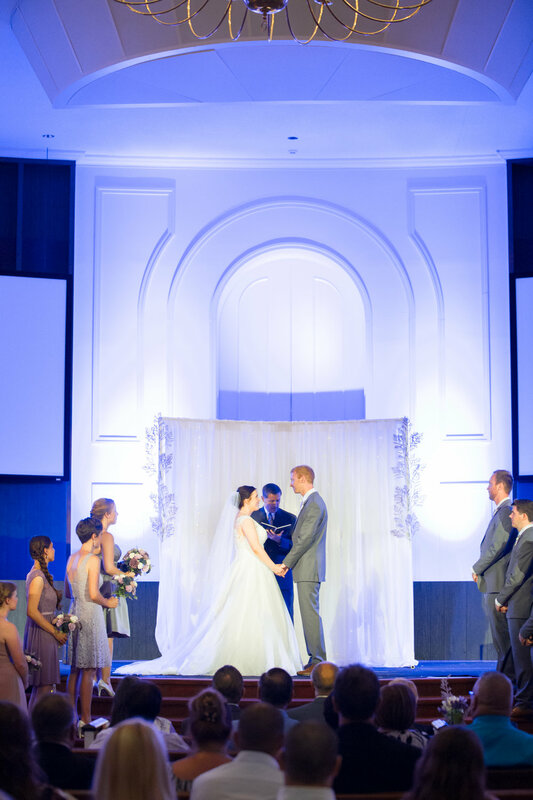 We used silk flowers for the decor that lined the aisle and for the backdrop."